February asteroids: A hit and a miss! New information provided by a worldwide network of sensors has allowed scientists to refine their estimates for the size of the object that entered that atmosphere and disintegrated in the skies over Chelyabinsk, Russia, at 7:20:26 p.m. PST, or 10:20:26 p.m. EST on Feb. 14 (3:20:26 UTC on Feb. 15). The estimated size of the object, prior to entering Earth’s atmosphere, has been revised upward from 49 feet (15 meters) to 55 feet (17 meters), and its estimated mass has increased from 7,000 to 10,000 tons. Also, the estimate for energy released during the event has increased by 30 kilotons to nearly 500 kilotons of energy released. These new estimates were generated using new data that had been collected by five additional infrasound stations located around the world – the first recording of the event being in Alaska, over 6,500 kilometers away from Chelyabinsk. The infrasound data indicates that the event, from atmospheric entry to the meteor’s airborne disintegration took 32.5 seconds. The calculations using the infrasound data were performed by Peter Brown at the University of Western Ontario, Canada. 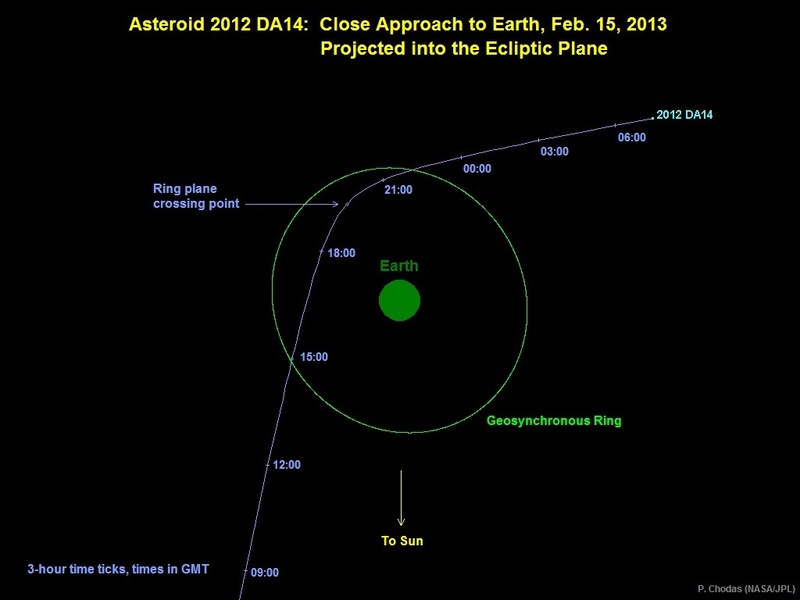 The trajectory of the Russia meteor was significantly different than the trajectory of the asteroid 2012 DA14, which hours later made its flyby of Earth, making it a completely unrelated object. The Russia meteor is the largest reported since 1908, when a meteor hit Tunguska, Siberia. This entry was posted in Uncategorized and tagged asteroid, astronomy, Meteor, meteorite, NASA, NEO. Bookmark the permalink.